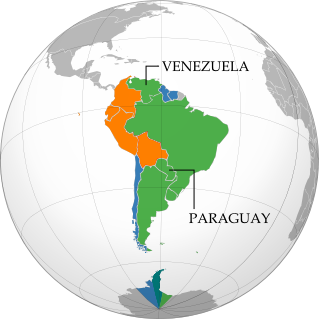 South America's intergovernmental organizations: Mercosur in green, the Andean Community (CAN) in (orange), and remaining members of UNASUR in blue (claimed territorial extents). Map by Evan Centanni, based on this map by Wikimedia user Luan. After over six years of waiting, Venezuela today officially joined Mercosur (the "Southern Common Market"), one of South America's two main trade blocs. The country was previously part of the continent's other major bloc, the Andean Community (CAN), but left that organization last year in anticipation of the switch to Mercosur (see Venezuela Leaves Andean Community). By the time the Venezuela left CAN last year, its application had finally been approved by all Mercosur member states except for Paraguay; but despite support from that country's president, an opposition party in its congress continued to block Venezuela's entry into the trade organization. That all changed last month, when Paraguay's government was overthrown in a political spectacle that many denounced as a thinly veiled coup. The country's membership in Mercosur was suspended as a result, and the rest of the organization quickly took advantage of Paraguay's absence to vote Venezuela into the group. Full membership for the newcomer was scheduled to enter effect on July 31, 2012. Mercosur was founded in 1994 by Argentina, Brazil, Paraguay, and Uruguay, with Venezuela today becoming the first new full member (several other South American countries are "associate members" or observers). Integration within the bloc includes a customs union (free movement of goods across borders) as well as economic and judicial coordination between member states. The countries of both Mercosur and the Andean Community also belong to the Union of South American Nations (UNASUR), a broader organization that includes all of the continent's sovereign states. Mercosur and UNASUR are the abbreviations based on the groups' Spanish names, but they are also known by their Portuguese abbreviations, Mercosul and UNASUL. Graphic of Venezuelan flag is in the public domain (source).